Prior to the tragic passing of Amy Winehouse, the most shocking story in the music world was the lurid, chilling plot to kidnap and murder British vocalist Joss Stone. Stone is back in the news this week but for much happier reasons. She's been freed from her label and is releasing a brand new album called LP1. She's also part of Mick Jagger's supergroup Super Heavy (that album is due later this year). 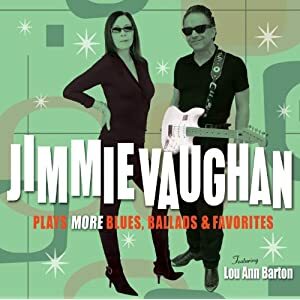 Jimmie Vaughan follows his Plays Blues, Ballads, & Favorites with Plays More Blues, Ballads & Favorites. The first volume was Vaughan's first record in ages and was a very solid listen. I've got my copy of the sequel on its way as we speak. Country singer Eric Church and former Destiny's Child vocalist Kelly Rowland also have new records out this week and that, boys and girls, is about the extent of our highlights. Take a peek, see what I missed, and look forward to next week. Culture Club - Miss Me Blind - Greatest Hits Live! Elvin Jones - Illumination! / Dear John C.
Oscar & The Majestics - No Chance Baby! Romweber, Dex Duo - Is That You In The Blue? Shirley Scott Trio - For Members Only / Great Scott! !